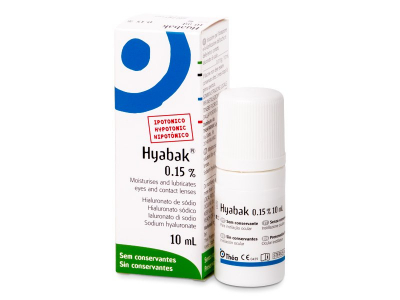 Haybak are eye drops containing 0.15% hyaluronic acid, thus providing natural instant relief in case of irritation and discomfort caused by fatigue, air conditioning, dust, dry air, smoke, working for extended periods in front of a screen, dry eye syndrome, and more. These drops combat redness and itch, and restore the tear film with just one drop. This package contains 10 ml. These drops can be used up to 3 months after opening. Hyabak eye drops are also suited to relieve any discomfort from wearing contact lenses. There is no need to remove your contact lenses when applying these drops. Normally, one drop in each of your eyes suffices in order to refresh the eyes. This can, however, be adjusted to your personal needs. Thanks to the addition of hyaluronic acid, these drops are able to heal and moisturize your eyes, and mimic actual tears in a natural way, without any added preservatives. The addition of Actinoquinol allows these drops to help block harmful UVB rays from the sun. Of course, please be sure to always have sunglasses on hand as well. Only sunglasses are able to fully protect your eyes against UV rays. Hyabak makes use of the patented ABAK dosing system, which delivers a consistent drop each time. The entire bottle contains about 300 drops in total. This unique dosing system also helps keep out dirt, bacteria and contaminants, keeping your drops sterile.